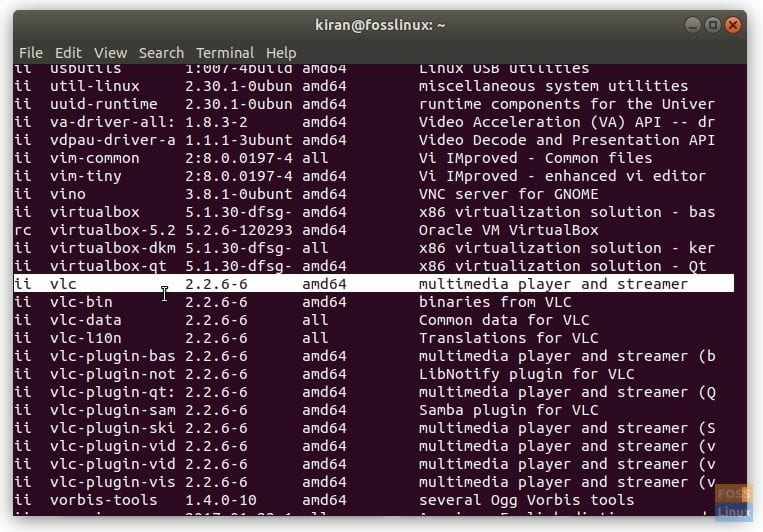 Uninstalling the software from the command line via Terminal is one of the most important tasks while dealing with troubleshooting a remotely connected Ubuntu PC. In today’s Terminal Tuts session, let’s take a deep dive into it. The following guide is tested on Ubuntu 17.10 but should work on older Ubuntu versions as well as Linux Mint, and elementary OS. You should see a long list of applications. Note down the name of the program which you want to uninstall. For example, I want to remove VLC Media Player, which is listed as just ‘vlc’. Step 2) To uninstall a program, we shall use remove command along with apt-get, which is typically used to install applications. Of course, sudo command to carry out superuser tasks. There are two important things to consider on what’s your uninstallation plan. On the other hand, use –purge command to completely uninstall the app if you plan not to reinstall the app. Now that you have uninstalled the software, you may want to do some extra cleanup to remove the dependencies of the software you uninstalled now or may be in the past. Dependencies are the apps and libraries that are used by the software you no longer have in your PC. Note that it is entirely safe to do so because no application is using them. As you see autoremove command is generic cleaning command for any obsolete packages that are left over in your PC. I’m new to command line and terminal. Being a “neat freak”, I really appreciate this info on keeping my system clean…thank you!